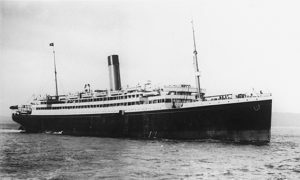 En route from Liverpool to Halifax, on 25th January 1917 White Star’s Laurentic hit two mines that had been laid by German submarine U80 in Lough Swilly. She had 479 passengers aboard, mainly naval personnel, and £5 million in gold bullion, to be used to purchase war munitions. All told, 354 aboard died, many dying of exposure in their lifeboats in the freezing weather that night. A few weeks later attempts were made to recover the gold, but bad weather prevented them salvaging very much. In 1919, salvage operations began to try to recover the bullion and eventually virtually all of it was eventually lifted. Laurentic had been launched at Harland & Wolff, Belfast, on 9th September 1907, and could carry 230 in First, 430 in Second and 1,000 in Third, plus a large refrigerated cargo. She had a combination of two reciprocating engines and a low-pressure turbine, and was a test bed alongside her sister, Megantic, for the system to be installed in the Olympic Class. 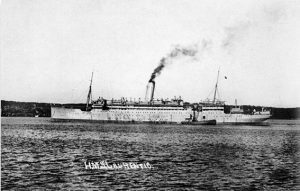 She had been requisitioned as a troopship on 13th September 1914.